At Britax, we know that traveling with your car seat may be cumbersome. Thats why we developed the Britax car seat travel bag to make travel easier, while also protecting your car seat. 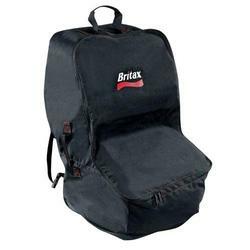 The Britax car seat travel bag fits all Britax car seats and most other brands. The convenient carry handles, padded back-pack style straps, and built-in wheels accommodate any travel situation. With its wide, double-zipper opening, its easy to get your car seat in and out in a hurry. The Britax car seat travel bag has also been built to last with water-resistant fabric and a durable, rubberized base. With the Britax car seat travel bag, youll have one less hassle when you travel. Fits all Britax car seats and most other brands.